This very thich grade offers finer partical retention than Ahlstrom 111 with high wet-strength and loading capacity. Ahlstrom 121 is recommended for the clarification of liquid suspensions loaded with fine particulates. 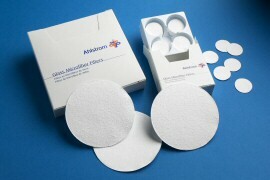 Ahstrom 121 is also used in membrane pre-filtration and is also found in quantification of solids, and LSC (Liquid Scintilation Counting) techniques that require high loading capacity. This high performance grade is designed to retain extremely fine particals to 0.7um. Ahlstrom 151 has retention comparable to membrane filters while providing higher flow and loading capacity. Ahlstrom 151 recommended for filtering fine precipitated proteins. In the filtration of nucleic acids and difficult biomedical solutions, Ahlstrom 151 is used in combination with Ahlstrom 141 as a highly efficient protective and retentive pre-filter to extend the loading capacity of membrane filters. Grade 151 is recommended for use in TCLP testing as described in test methods for evaluating solid wastes, EPA method 1311. This popular grade offers finer paticulate retension and higher flow rate than traditional analytical filter papers. Ahlstrom 161is used in general laboratory applications, cell harvesting, liquid scitillation counting and in the monitoring of air & water polution. Ahlstrom 161 is generally recommended for water pollution monitoring techniques for total suspended solids.